Ahhh the sketchbook! It is one of the most undervalued process' of artists. It is an art form in itself. Sketchbooks help foster ideas, clarify concepts, find a style (or voice), give us the strength to overcome blocks and creative fears, help us to focus, observe, be FREE. Are you ignoring this process or are you allowing it to help your creativity right now? 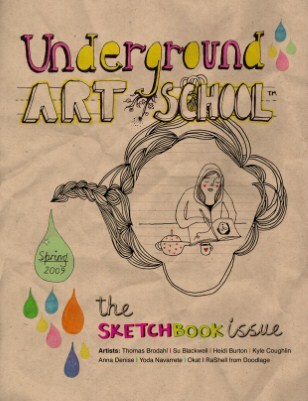 Cover artist Heidi Burton. Interviews with Okat, Su Blackwell, and Yoda Navarrete (Lady Orlando). Art School Crushin' on Kylo (Kyle Coughlin). Michael Nobbs share his top 20 drawing sites. Anna Denise records, observes, and sketches her creative process! Post-it Gallery curated and designed by RaShell from Doodlage. Graphic designer Thomas Brodahl sketches on his skin.